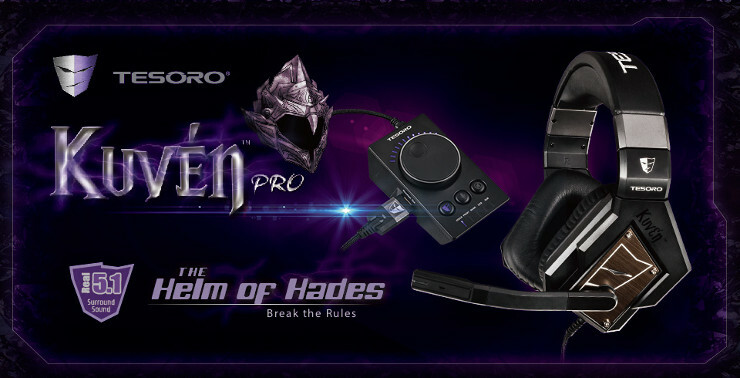 August 14, 2014, Milpitas CA, USA – Tesoro Technology USA Inc., a manufacturer of high-tech gaming products, today releases the Kuven.pro true 5.1 surround sound gaming headset. With a total of 8 drivers (4 in each ear cup) and fully customizable control of every channel, the Kuven.pro immerses the player into the battlefield by providing realistic, directional audio. Named after the helmet of the Greek god of the underworld, Hades, the Kuven allowed its wearer to turn invisible to gain the tactical advantage in battle. Much like the mythological Kuven, the Kuven.pro allows its wearers to gain the advantage over their enemies by letting gamers pinpoint enemy movements, such as footsteps, before the enemy sees them. Each ear cup of the Kuven.pro contains 1 subwoofer, 1 center speaker, 1 front speaker, and one rear speaker, to truly provide directional sound. Each channel (Voice / Front / Rear/ Cen. / Sub.) can be customized via the removable in-line control. The controller also allows gamers to instantly turn off the microphone or speaker. Additionally, for those looking for even more, the Kuven.pro can be switched to virtual 7.1 surround sound audio mode. Stylish aluminum plates with a laser cut Tesoro face line the sides of the Kuven.pro. The eye of the Tesoro face as well as the in-line control feature purple LED illumination. The Tesoro Kuven.pro will be available for 109 EUR / 89 GBP at the end of August.